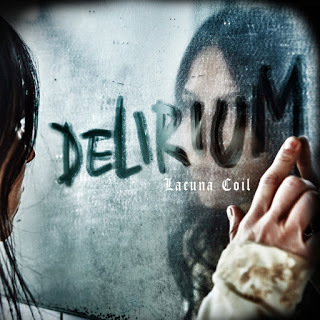 The new album by Lacuna Coil is here and I am very pleased to write a review about it on DutchMetalManiac! When hearing the first few tones of the album, you would think it is going to be a bombastic and melodic metal album, somewhere along the lines of Epica for example, but that’s not really the case! The album sure has its melodic moments, the presence of beautiful high pitched keyboards and of course the angelic sturdy voice of female vocalist Cristina Scabbia, but on this album, the band chose to combine powerful screams and grunts with Cristina’s clear and well-controlled voice. I have to say that the record sure lives up to its name, Delirium. A delirium is a sort of temporary psychotic state someone’s mind can be in. As I was listening to the album, often I found it hard to concentrate on what I was hearing, because so much stuff is going on in just one song. Awesome psychedelic guitar riffs, creepy kids on Take Me Home and the always shifting dynamic between the male and female vocals combined with some electronic effects here and there, Lacuna Coil has it all! But I am concerned if it all isn’t a bit too much of everything. It seems to me that the band wants to show what they are capable of in under 45 minutes. Which is a bit strange to me because this band is well known and respected in the metal world. So the hyperactive and sometimes somewhat unstructured songs on the album do nothing for me personally. Luckily for me, tracks like Downfall, My Demons and the title track Delirium are a lot more my taste! Maybe that’s because those songs feature the beautiful high pitched voice of Cristina Scabbia more prominently. Who knows? I have absolutely no doubts whatsoever that this album is going to do well, because despite its restless vibe, it’s produced very neatly. Heavy guitars and powerful grunts and everything else another great Lacuna Coil album needs!